Hi everyone and welcome to my first blog entry. I’m Rosanne, but all my friends call me Rosie and I’m a stay-at-home Mom who has always loved craft and especially sewing. I started sewing doll clothes around 8 years of age and was so proud of my creations that I kept them hoping that when I had a daughter, she would play with them. Of course her dolls were a totally different size and shape to mine so none of them fitted and I had to make new doll clothes for her. Finding doll clothes patterns that would fit her dolls was not easy and I had to make lots of changes to patterns I bought so I drafted my own. I started sewing them just the way I had learnt over the years to sew children and adult clothes …. gosh I couldn’t remember making doll clothes being this tricky! After a lot of frustration and hours of trial and error, I started discovering great shortcuts and secret tips to making doll clothes so much easier and Alyssa ended up with a huge wardrobe for her dolls and I started my own very successful online business Rosie’s Dolls Clothes. 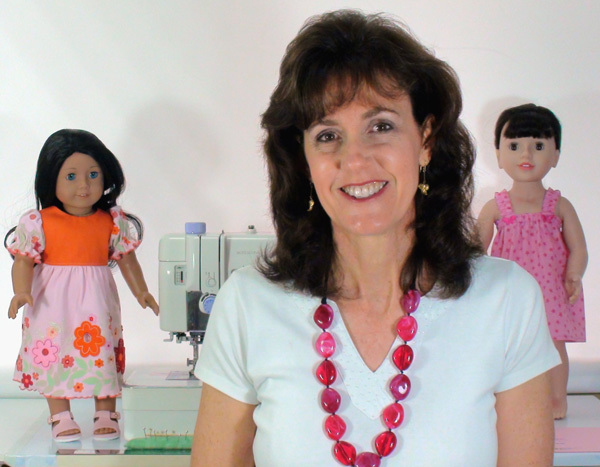 Because I’ve heard so many people say it’s too fiddly to make doll clothes, I decided to put together a video course How to Make Doll Clothes that shows all the secret tips that make sewing doll clothes super easy. I want you to enjoy sewing doll clothes for your child’s doll and I want to encourage young children back to the wonderful art of sewing. I have also decided to share my many doll clothes patterns with you and because I want you to make them with confidence, I have included videos that show you each step of the way. The Doll Clothes Patterns are downloadable so you can print them straight away and the instructional videos stream right to your own computer. I will be adding more patterns soon, so keep following. Would you mind posting the measurements of the American Doll?? I am a grandma that lives far from the doll’s owner and have no idea on the measurements. Hi Sharon, yes it is a little difficult to make doll clothes when you don’t have the doll to try the outfit on. I have been told my patterns are a ‘true’ fit for the 18 inch American Girl doll however because they have a fabric body there are sometimes small variances in the measurements of the torso. I have the measurements of my American Girl doll listed on my Doll Sizing page. Happy sewing, Rosie.